The new look Invitational Toorak Sculpture Festival ‘Took it to the Streets’. 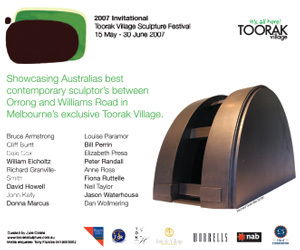 In its 6th year, the exhibition which traditionally has displayed sculptures in the shop windows of Toorak Village, took a new direction with a new invited curator- Julie Collins, where she invited high profile Australian sculptors committed to their practice, quality, and the continuous journey of innovation through contemporary sculpture, to take part in the 2007 exhibition. 18 innovative large outdoor sculptural works were displayed on footpaths, in alcoves & within plazas, with many providing 24 hour viewing. For 7 weeks from 15 May to 30 June, the Village was home to some of Australia’s best sculptures and the exhibition provided all with the perfect opportunity to discover these artists and explore the Village. It created much discussion on the street amongst shoppers, visitors & traders themselves. The large sculptures just sprouted on May 15, waiting to be discovered by all that walked, drove and trammed down Toorak Road. Bruce Armstrong, John Kelly, Louise Paramor, Anne Ross, Neil Taylor, Elisabeth Presa, Cliff Burtt, Jason Waterhouse, Dan Wollmering, Bill Perrin, Richard Granville-Smith, David Howell, Peter Randall, Donna Marcus, Dale Cox, Fiona Ruttelle, William Eicholtz. City of Stonnington was our Major Sponsor, with 7 local business sponsors: NAB Bank, NAB Private Bank, TOK H Shopping Centre, TOK Corporate Centre, Toorak Village Dental Care, Worrells Mercedes & Biggin & Scott Real Estate providing the signboards.